This service occupancy agreement grants a licence to occupy to an employee living in accommodation (from a single room to a whole property) provided by the employer for the better performance of their work duties. Certain types of employment often provide accommodation as part of the remuneration package. Such accommodation is called “service occupancy” or sometimes “tied accommodation”. In law, it is either a residential licence with terms tied to the employment contract or a lease agreement. This service occupancy agreement creates a licence. It provides for the full protection of the employer-licensor. The advantage of creating a residential licence is simple: with a service occupancy agreement, the right to occupy terminates when the employment ends; however, if you let property under a tenancy agreement instead, then you may find it difficult to end the tenancy and obtain vacant possession when employment ends. This service occupancy agreement enables you to obtain possession when the employment ends. The default status of an arrangement whereby you provide accommodation for an employee is that he is your tenant under tenancy agreement. If you do not have a written tenancy agreement, you don’t have control over property (even after his employment ends). So, if you want to retain control of your property, you have to use either a formal tenancy agreement or arrange the deal in such a way that it really is a service occupancy agreement. The terms above have not changed at the time the law is applied. If you think your deal may not qualify, buy a lease agreement. If it does qualify, then you can easily edit this document to be perfect for what you need. The template allows you to comply with the Residential Tenancies Act 1986. This agreement is very flexible and can cover a business in any industry or where the employer is an individual. The type of accommodation is not important, and could range from a bedroom to a whole detached property. Includes sensible, practical provisions to protect the landlord’s interests. 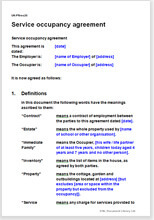 Full description of the property and the services that the employee should expect to receive in residence. A ‘menu’ of nearly 50 provisions determining what employer may or may not allow the employee to do in the property. Provision for the occupier’s rights and restrictions when the property occupied is part of a large complex such as a school or industrial buildings. Provision has also been made for the employer to move the employee to different accommodation if required or to terminate the licence if the requirements of the job change so that living close is no longer required. Extra to the document is a draft paragraph which can be added to any contract of employment to confirm the proposed arrangement for service occupancy. Use that too, to make sure there is no doubt as to the status of the arrangement.